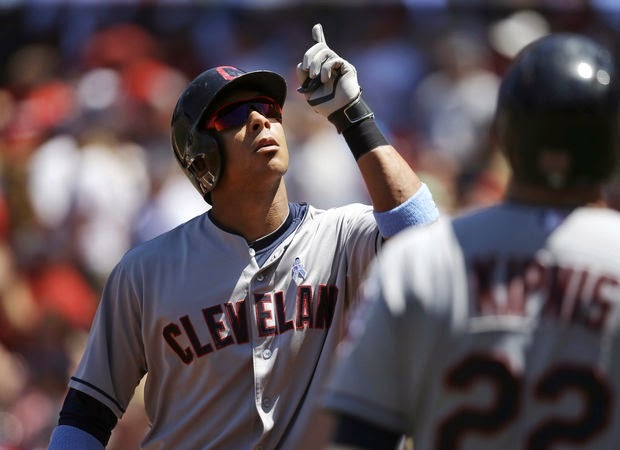 Michael Brantley was not projected to be much of a home run hitter. year after year, writers talked about how he lacked power. and i would defend him against this, saying that with all the other things he does for the team, he doesn't need to worry about being a power hitter. well, i think Michael had enough of that because it's June 15, and he's already hit his 11th home run, most on the team by 3 right now. he leads the team in pretty much every category that matters, and it's pretty obvious he's on his way to the first All Star game of his career. there are more career highs coming, he's hitting too good right now for there not to be. he's going to shatter some of his other previous career highs this year, no question. but right now, let's talk about his latest feat. i knew when this day came it would be special, for him as a player and for me as a fan. and maybe Father's Day (Michael's first officially) had something to do with it, maybe not. but either way, the pride i am feeling for this modest, underrated athlete is immense. it's going to be a season of happy tears for me, and i can't wait to see what he accomplishes next.